On Wednesday, September 14th, we took a Day Ride. Our destination was the Pinnacle at the Cumberland Gap National Park. We left our home in North Knoxville at 10:15am. It was already warm with temps forecast to be in the mid 90’s. We rode north on Clinton Highway and stopped to fuel up and have a quick snack. We then continued into Clinton, then on to Rocky Top, Caryville and into Lafollette. In Lafollette we took 25W- a beautiful road that runs up the mountains into Jellico. We came this way on 25W. And we’re headed this way on 25W toward Jellico. In Jellico we stayed on 25 north right into Kentucky and on into Williamsburg. In Williamsburg we took 92 east into Pineville, Kentucky. We rode into downtown Pineville- below the Chained Rock. We ate at the FloCoe restaurant. Inside the FloCoe. The people here are super nice. And the food is super fresh, homemade, and yummy. From Pineville, we rode south on 25E into Middlesboro, and then onto the Cumberland Gap National Park. Entrance to the Cumberland Gap National Park. First we stopped at the visitor center before riding up to the Pinnacle. Inside the visitor center. The staff is friendly and helpful. There is a gift shop and museum inside the visitor center. After spending some time inside the visitor center, we began the four mile ascent to the Pinnacle. The ride up to the Pinnacle is quite extreme- straight up the mountain with some fairly tight switch backs, which ends at a large, nice level parking lot. After parking our bikes, we began the short hike to the Pinnacle. Stone art at the Pinnacle parking lot. The beginning of the walk from the parking lot. View from the Pinnacle Overlook. The Pinnacle Overlook is pretty awesome with some spectacular views over Tennessee, Kentucky and Virginia. It’s located just above the 25E Tunnel. You’ll stand and stare a long time! Looking down into Cumberland Gap. Another nice visitor took our photo. Thanks! Even the clouds are spectacular! After spending some time on the Overlook, we started back down toward the parking lot, stopping to look at the point where Kentucky, Tennessee, and Virginia intersect. The spot is nicely marked with a plaque. Close up of the spot on the plaque. And a photo on this day of the spot. Can you see it? It’s out there somewhere. Further down the trail, you can stand in both Kentucky and Virginia. Close up of the boundary line. Back in the parking lot. Time to ride back down. After spending time at the Overlook, we rode back down to Middlesboro and stopped at the Dairy Queen. Cold ice cream tastes great on a hot day! After cooling off with some ice cream, we rode south on 25E and through the Cumberland Gap Tunnel. View of the Tunnel entrance. In Tazewell, we got on 33 south. 33 took us just north of Maynardville where we took 170 back to 33, and on into Knoxville. We arrived home at 6:30pm and our total ride was 197.6 miles. 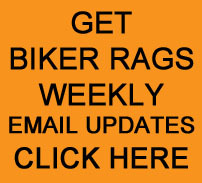 This entry was posted in Day Ride and tagged Biker Rags, Cumberland Gap National Park, Day Ride, Pinnacle Overlook, The Flocoe. Bookmark the permalink.